To be eligible to sit for the REHS/RS credential examination, a candidate must meet all of the criteria for Track A or Track B or Track C.
You must be able to answer YES to all the questions for Track A. If you answer a question with a “No,” proceed to Track B. Do you have a Bachelor’s degree, Master’s degree or PhD from a college or university in the United States? For foreign degrees and diplomas, see the Candidate Information Brochure section on foreign education. Is your degree in Environmental Health? Is your school and degree program on the appropriate EHAC list below? If you answered “Yes” to all three questions above, you can apply on Track A. You will not need to submit proof of work experience. You must be able to answer YES to all questions for Track B. If you answer a question with a “No,” proceed to Track C.
Do you have a Bachelor’s degree, Master’s degree or PhD from a college or university accredited in the United States? Your degree can be in any subject. For foreign degrees or diplomas, see the Candidate Information Brochure section on foreign education. Do you have 30 semester hours (or 45 quarter hours) of college credit in basic science coursework? Basic sciences include Life Sciences, Natural Sciences, Physical Sciences or Health Sciences. Do you have credit for a college level Math or Statistics class? Do you have two years or more experience working in environmental health*? Work experience should be full-time paid work. * Eligible areas of environmental health include general environmental health (including inspections, environmental microbiology, and contamination control), food protection, wastewater, solid and hazardous waste, potable water, inspections of facilities, vectors and pests, institutions and licensed establishments, swimming pool inspections, radiation, occupational safety and health, healthy housing, indoor air quality, disaster and emergency planning, and environmental health issues related to climate change. On Track B above, if you said YES to questions 1, 2, and 3 but you do NOT have two years of work experience in environmental health, you can apply on the “In Training” Track. You would choose REHS/RS-In Training (I.T.) on the application. You will not be required to submit proof of work experience. If you pass the exam, your certificate will say, “REHS/RS – In Training.” You will then have 3 years to obtain 2 years of work experience. Once you have acquired that experience, you can qualify for the full REHS/RS certificate by notifying NEHA and submitting proof of work experience. If you do not obtain the 2 years of work experience, your “In Training” status will expire and you risk losing the credential and may have to reapply and retake the exam. On Track B above, if you said NO to question 1 (and you do not have a foreign degree either) OR said NO to question 2 (science hours) OR question 3 (math class), then your education does not meet the requirements for the REHS/RS credential set by the NEHA Board of Directors. The Board of Directors has ruled that NEHA cannot accept work experience in lieu of college coursework. Applications must be completed and returned to NEHA for review at least 4 weeks prior to the exam date. If an application is received less than 4 weeks prior to your planned exam date, you may have to schedule the exam for another date. Official College Transcripts. To be considered an official transcript it should be received at the NEHA office in the sealed envelope from the College Registrar’s Office/Transcript Office. It can be sent directly from the school to NEHA or submitted with the application in the sealed school envelope. Electronic transcripts from the school or transcript service are accepted when e-mailed to credentialing@neha.org. Third party review (applicable for candidates with foreign education). Applications are good for 2 years from the date NEHA received them. If you have not tested within 2 years of applying, you will need to submit a new application and fees. The REHS/RS examination consists of a total of 250 multiple-choice questions. The exam is split into two parts of 125 questions each. Candidates are given a total of four (4) hours to complete the entire exam or two (2) hours for each part with a short 10-minute break in between. Of the 250 items, 225 will be scored. The remaining 25 questions will be unscored, pilot questions. Those items will not be called out within the exam. Below is an outline of the different content areas the examination covers and the percentages allotted to each of those areas. Please use this outline as a guide when preparing for the examination. The REHS/RS exam is offered annually at the NEHA Annual Educational Conference (AEC) & Exhibition. Special test sites may be arranged through NEHA. Must have a minimum of 3 NEHA credential testing candidates. In order to accommodate requests for special test sites, arrangements must be made a minimum of 6-8 weeks prior to the requested date. The fee to set up a special test site is $350.00. For groups of 10 or more exam candidates, the special test site fee is waived. Please contact NEHA for a Special Test Site Request form. NEHA will send you an authorization letter via e-mail when your application is processed as approved. Then you will get another e-mail, 1-3 days later, from Pearson VUE c/o PTI. That e-mail will have your PTI ID number and instructions on how to schedule the exam at Pearson VUE. The PTI ID number is good for one year. On test day you must bring your photo identification (i.e. driver’s license or passport). If you need to postpone your scheduled computer test, you must contact Pearson VUE at least 24 hours in advance of your scheduled test time. If you do not show up and did not give at least 24 hours’ notice, you will forfeit your Exam Fee and your Computer Test Fee. Contact NEHA to pay your fees again so you can be authorized to reschedule. NEHA will send an admission letter approximately 2 weeks prior to your test date. The admission letter will detail the exam date and location, reporting time, and starting time. Those that do not appear on the date of the exam at the appropriate time will forfeit all exam fees. Persons arriving after the examination has started may not be admitted. If you lost your admission letter or have not received an admission letter at least 2 days prior to the test date, please contact NEHA immediately. Only approved candidates will be admitted to the exam. No walk-in applicants will be admitted. On test day please bring with you your admission letter, photo identification (i.e. driver’s license or passport), and sharpened #2 pencils. The NEHA REHS/RS examination will report scores using scaled scores that range from 0 to 900 with a passing score of 650. The raw passing score is mathematically transformed so that the passing scaled score equals 650. This process is similar to the way one adjusts Celsius and Fahrenheit temperature scales. While the values may differ the temperatures are the same. For example, water boils at the same temperature regardless of the scale used. Candidates who pass the examination will earn scaled scores of 650 and above, and those who fail will earn a scaled score between 0 and 649. A scaled score is NOT a percentage score. In summary, a scaled score is merely a transformation of a raw score. Scaling is done to report comparable results when forms and raw passing scores vary over time. Your score will be based on the number of questions answered correctly. If you are unsure of the answer it is better to guess. You will not be given credit for any question left blank. Your exam results will be mailed to you from the NEHA office 4-6 weeks after the administration. If you pass the exam, NEHA will send you a credentialing packet with a score letter, certificate, wallet card and Continuing Education information. If you fail the exam, NEHA will send you a score letter and a Retake Application. You must wait at least 90 days from your test date before you can retake the exam. To retake the exam, you need to submit the Retake Application and pay the Exam Fee and Computer Test Fee, if you will retake the exam on computer. You do not need to do the whole application again or resubmit transcripts. There is no limit on the number of times you can retake the exam, but you must wait 90 days between each attempt. Below is a list of study references that are recommended to assist the candidate in preparing for the REHS/RS examination. Most references are available for purchase through the NEHA online Bookstore. REHS/RS Study Guide (Fourth Edition), 2014, NEHA. Centers for Disease Control and Prevention (CDC). Community Assessment for Public Health Emergency Response (CASPER) Toolkit: Second edition. Atlanta (GA): CDC; 2012. If you have college or university education from outside the United States or its territories, you must have your foreign education evaluated by a “third party” foreign education evaluation service to determine equivalency to a Bachelor’s degree in the United States. You must submit an evaluation report with your NEHA Credential Application or the report can be sent by the evaluation service directly to NEHA. NEHA cannot evaluate foreign educational documents even if they have been translated into English. All foreign transcripts must be evaluated by foreign education specialists. NEHA strongly recommends you choose a service that is a member of the National Association of Credential Evaluation Services (NACES). For information on NACES member companies, visit: www.naces.org. Canadian education is considered foreign education. It must be evaluated by a third party evaluation service. If you have any questions regarding your foreign education, please contact credentialing@neha.org or 303.756.9090 ext. 310. Candidates with education from within the United States can request NEHA to review their transcripts for eligibility separate from the application procedure for $50. A transcript review form must be completed and is available at Transcript Review Request Form (PDF). Please note that this is not required as it is only for individuals who are not sure if they qualify academically or for individuals that need a letter from NEHA stating they meet the academic qualifications. Please see additional instructions on the form. The $50 fee is non-refundable even if NEHA finds that your education does not meet the REHS/RS qualification requirements. It can take 2-4 weeks for your transcripts to be reviewed and you will be notified by letter and/or e-mail. 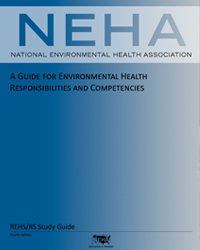 You can access the Credentialing Handbook at www.neha.org. Click on Professional Development, then click on Credentials and look for the link to the Handbook on the left side. Submit renewal fees for your credential every two years ($130.00 members; $345.00 non-members).